I have to decide what to do with my grandfather’s military uniform jackets. When he passed away several years ago, my grandmother hesitated about giving them to Goodwill, so I asked for them. I knew he valued the wool jackets with worn patches. They were to him what a wedding dress is for a woman – a barometer of youth and golden days. He was so proud that he could fit into them after a grandma-induced diet, that he modeled them for me whenever I visited. My grandfat her was an old-fashioned gentleman, born into a Midwestern upper middle class family with all the sensibilities and prejudices that came of the time. He was kind to his family, though, tolerating a monsoon of estrogen and talk about “feelings”. I think he was relieved when I got married, if only to have one more player for the men’s team. For many years, he was a book salesman, traveling all over the Midwest. He told funny stories with enthusiasm and wonderful accents. He loved to tell jokes. After I joined the Army, he was relieved that he finally had someone to talk to about his military experience. He’d tell anecdotes from his stints in the Navy and the Army, about customers he’d met on the road and about an idyllic childhood in Illinois. Big band music was his bailiwick. He would make tapes of the music he loved, recording himself as the DJ in between songs. Standing in the kitchen with his finger near the pause and rewind buttons, he’d say, “Listen to this part, kiddo.” He wanted me to hear what he heard, to not miss a trumpet solo or drum flourish. When I was younger, I learned to play Glenn Miller, Hoagy Carmichael and Tommy Dorsey on my flute (small band music!) and we’d play “Name that Tune”. My grandfather also helped me learn the value of civility and respect. He was from a different time – we argued about women in combat, gay rights, economic and foreign policy, exchanging several long and heated letters over the years about our beliefs. It never changed our regard for each other. It was never nasty or mean or irretrievably damaging to our relationship. It was okay to disagree and still like each other. I grew up abandoned by a father and living in fear of an alcoholic stepfather. My grandfather was there, walking me down the aisle when I got married and then years later, listening to my talkative toddler while she sat on his lap. 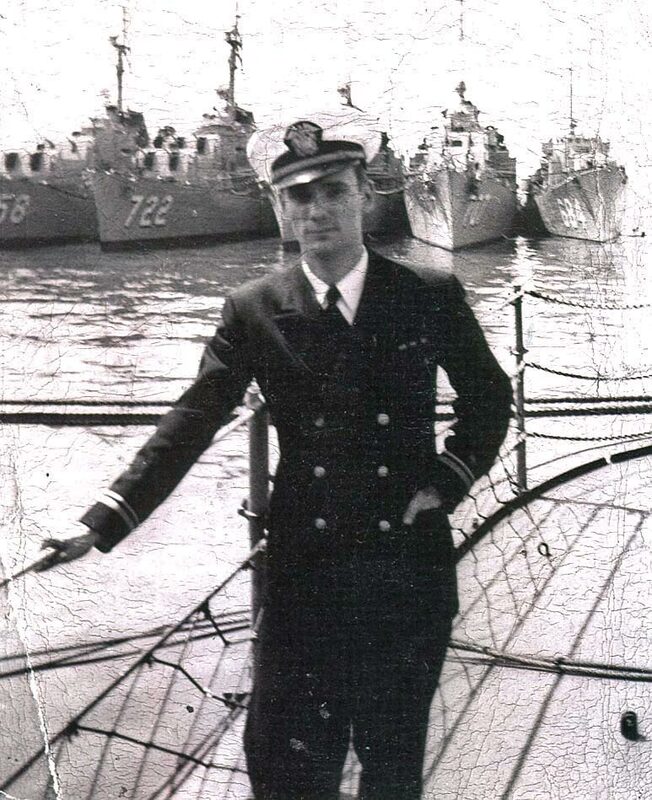 In a family where men have not come off well, my grandfather was the guy who redeemed them all. I mourn him now more than ever. My family of origin is extraordinarily private, insular and can be counted on one hand. There was no memorial or celebration of my grandfather’s life. There was no way for me to say goodbye or shed tears. One day he was just gone, with nary a whisper in the universe. It is human nature to want to leave an indelible mark, to pass on a part of ourselves – to know that we mattered. Sometimes this is what drives us to have children, to work so hard at a career or even to write a blog. Most of us will never pass this way again and only live on in the memories and hearts of the people who loved us. In a family as fractured as mine, so many memories have been forever lost. There are some memories no one wants to retain, but in the case of my grandpa, I will be his standard bearer. I will write about him, tell my daughter the jokes and stories, keep records, do my best to be a caretaker of the things that were important to him. He mattered in a way that all good people should. Not loudly, but immeasurably. His tumbledown end began with one stroke followed by another. One of our last phone calls ended abruptly, as I began to cry while he struggled to speak, an effort that surely exhausted him. I miss his stories, even though I heard them a hundred times. I miss his presence in the world. The music he loved so much will remain on my playlist and I will hear him saying “listen to this, kiddo”. For now, I’ll carefully store his jackets, so that someday, someone else will have to wonder what to do with them and recall the stories and music and that he was loved by me. And the beat goes on. Wonderful tribute. Thanks for sharing. Wonderfully told and very, very touching! Thanks – I went through some Kleenex on this one! Thank you. I seem to be waxing sentimental this week. I never knew my grandparents and I am very saddened by that. It was extremely hard to move my children away from both sets of grandparents because it is such a special relationship. I had crappy parents but as a child I always envied the kids that had grandparents more than the ones that had great parents. I was very fortunate to know my maternal grandparents but sad that my daughter doesn’t really know my mom. Unfortunately, the ideal is just that for most people and not the reality. I guess it’s more important to recognize the bright lights along the way, sometimes it’s a friend or a distant relative. My family is a patchwork quilt of friends and in-laws and that seems to do the trick. Thanks – it was nice to be able to pay tribute to my grandpa in some small form. I’ve lost a lot of loved ones in the past ten years, both parents and my youngest brother, assorted aunts, uncles and beloved in-laws. Even though they will always be in my heart, I still needed to keep some of each person’s stuff, just to touch once in awhile. I still have the dress my Mom wore to my wedding, the shirt my brother was wearing the day he was admitted to the hospital he never came back out of (I’ve still never been able to wash it), and an old plaid shirt that my Dad used to wear around the house. Every so often, I just have to go upstairs to that closet and just take a whiff…nobody else can smell it, but I can, and am always glad I kept that stuff. I go back and forth on passed down possessions, trying to remind myself that the items are not the people. After having seen and heard the implementation of people’s wills on occasion, I realize that too much stuff can become a burden to the living. But I’m also a little freaky about de-cluttering, so that’s just my take on it. Glad to know him a bit through your words, you wrote of him so well. My family has a huge excess of females and I would have loved to be able to read something like this by one of my children, about my father. They never knew him, perhaps they will enjoy my stories later..
That is my hope – that I can tell her about him. I was also fortunate enough to have gotten a lot of pictures of his life. I have tried telling mine but it’s too hazy for them yet and/or life has other priorities. I hope in time they’ll actually ‘know’ him through me. Man – I have been working in something about my grandfather for some time. It sounds like mine and yours were cut from the same cloth – what a great tribute. Thanks. He was definitely an old school gentleman and I miss him.